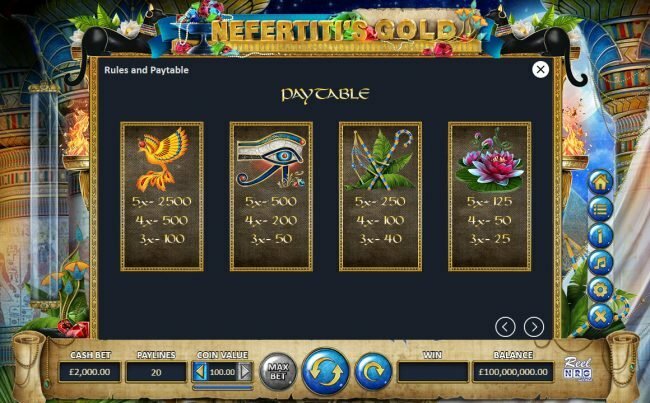 Nefertiti's Gold is a 5 reel online slot machine with a maximum payout of $250,000 using the ancient Egypt theme. 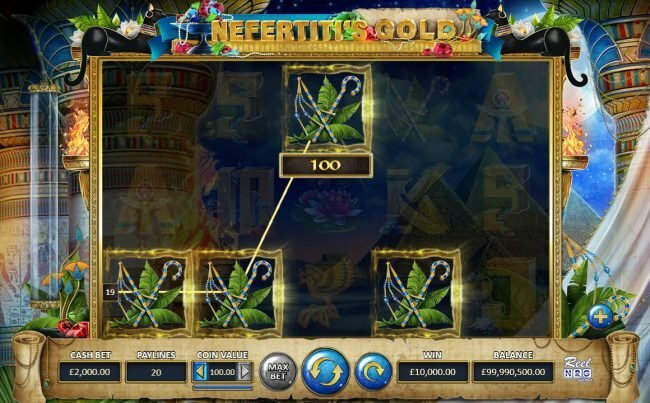 Nefertiti's Gold Slots has not been reviewed yet, be the first to rate this slot. 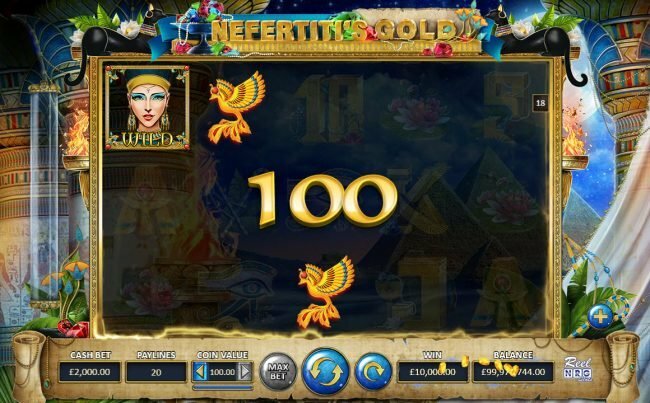 The Nefertiti&apos;s Gold Slot Machine, a fun to play 20 payline, 5 game reel video slot machine. 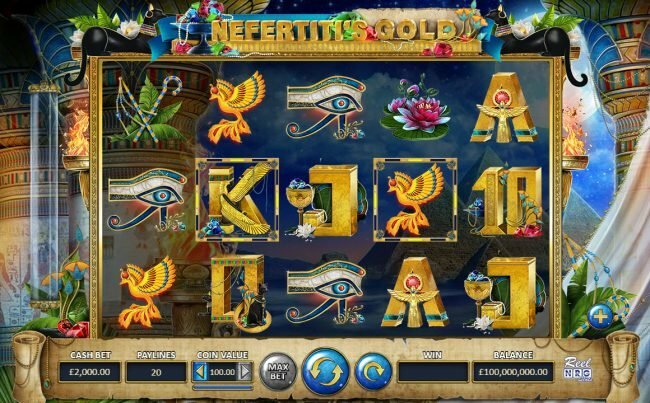 Watching this ancient Egypt set slot displays its depth with phoenix bird, Eye of Ra, crook and flail and flower, and also Nefertiti&apos;s Gold conveys more with ace, king, queen, jack, ten and nine putting you right in there. 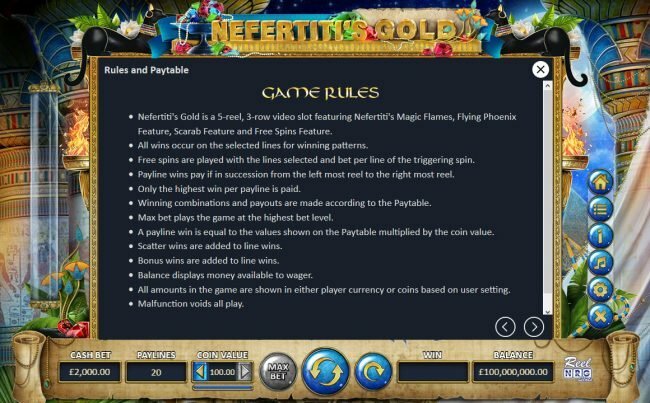 Wagering on Nefertiti&apos;s Gold is adjustable, allowing a small bet of $0.01 up to a full bet of $2000, you will have a lot of options. Go ahead and use many Nefertiti wilds for an insane payout on Nefertiti&apos;s Gold. 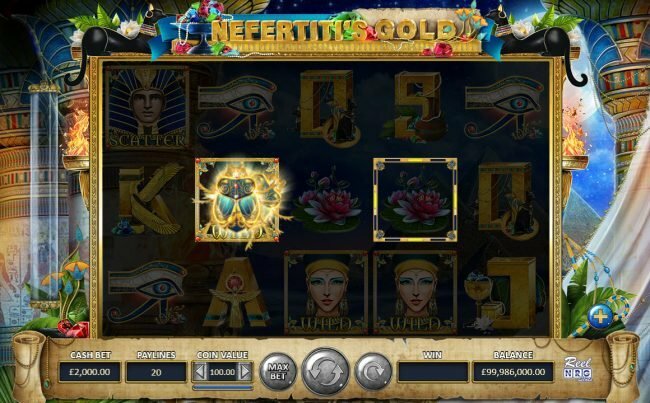 Multiple Sphinx slot icons will reward a great payout. 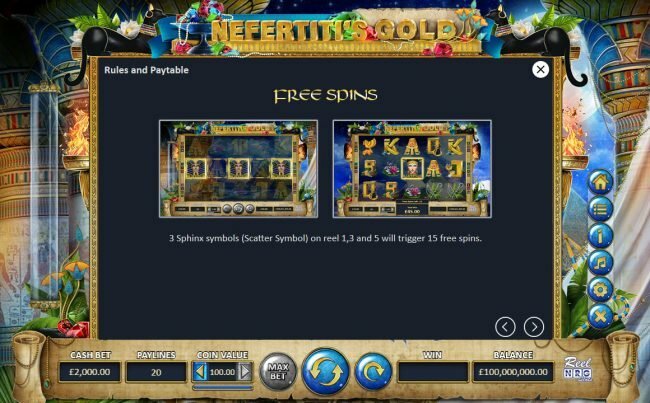 You will note that on a lot of Slots three or more scatters will start a Bonus feature. 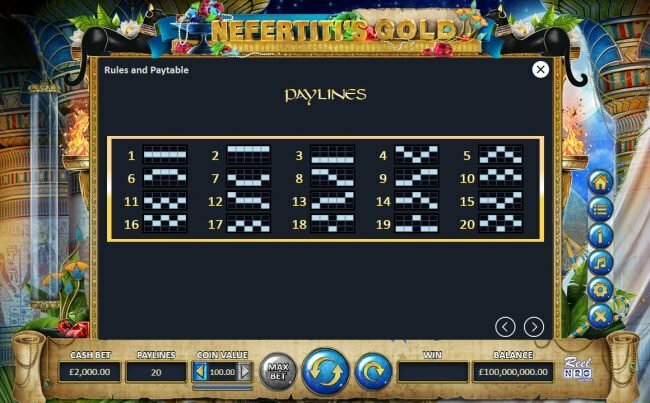 I can point to other online games like Dragon&apos;s Castle as it has 20 lines like Nefertiti&apos;s Gold, some others like Nefertiti&apos;s Gold and Shanghai Respin are enjoyable as well. Many of ReelNRG Online Slot Machines like Nefertiti&apos;s Gold act the same so be sure to find one that pays the best for you. 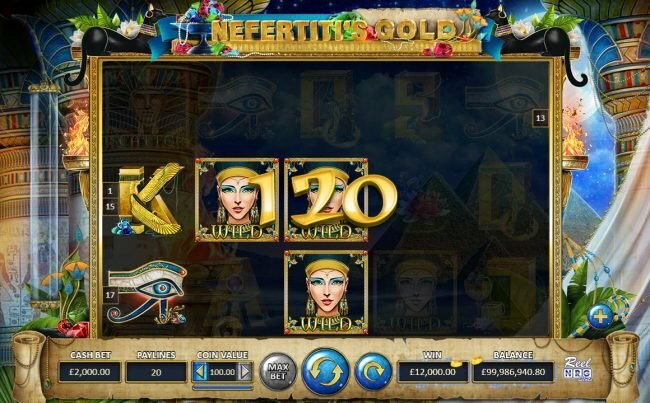 Nefertiti&apos;s Gold is a decent online slot, the ancient Egypt design is well thought out and the winning is good. Some other slots like Ella&apos;s Riches share in much of the identical feel. 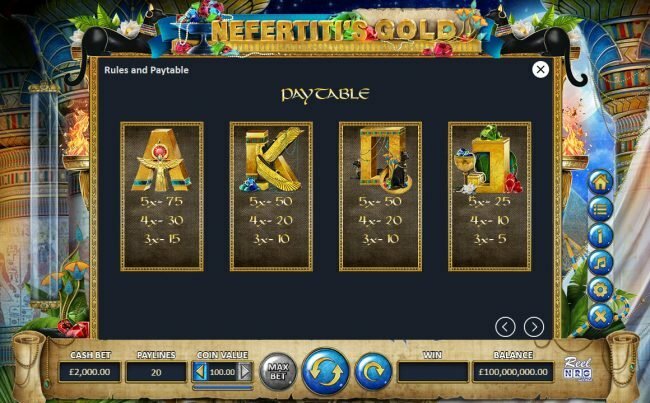 All online games offer a good possibility of cashing out big but in the end all slots favor the Casino. 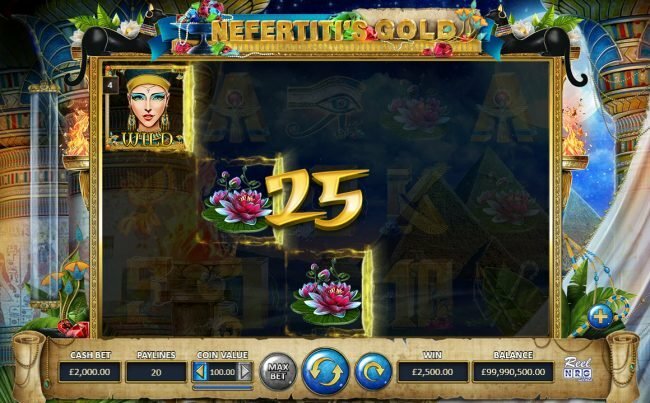 We think the feature piece of Nefertiti&apos;s Gold is obviously the best part. 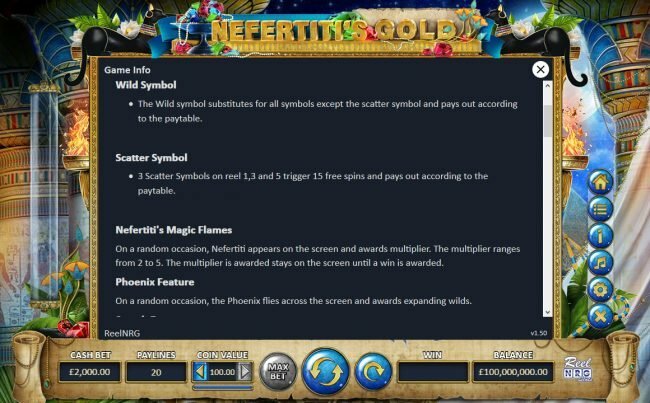 Following are some detail on the extras you are able to get. 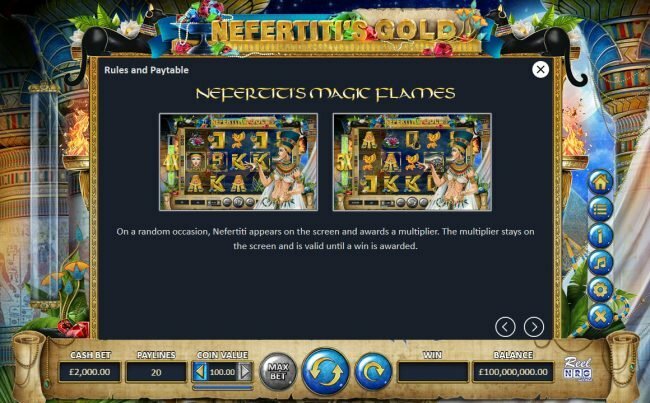 If you enjoy big amounts of credits, the Nefertiti&apos;s Magic Flames would appear to have been placed for you. Simply get random occurrence during any spin to launch. If you enjoy big juicy pay outs, the Phoenix Stacked Wild Feature would seem as it was thrown in there for you. Simply get random occurrence during any spin to launch. 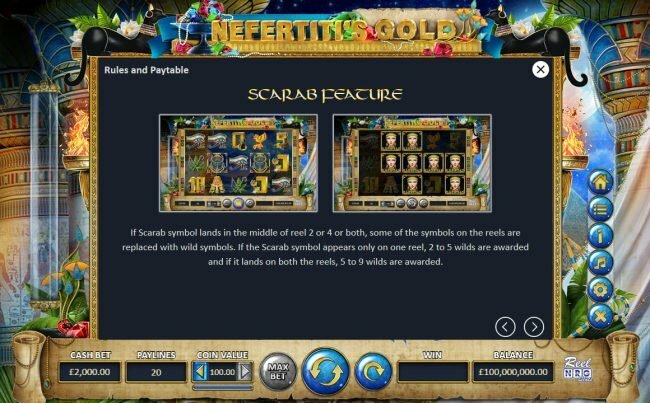 The Scarab Wild Feature is begun once you achieve scarab symbol landing in the middle of reel 2 or 4 or both, this exciting add on seems to produce very well. 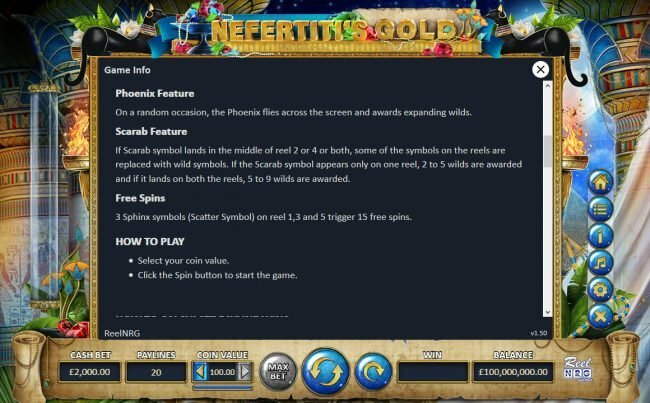 I really love the Nefertiti&apos;s Gold Free Spins and the riches it generates. 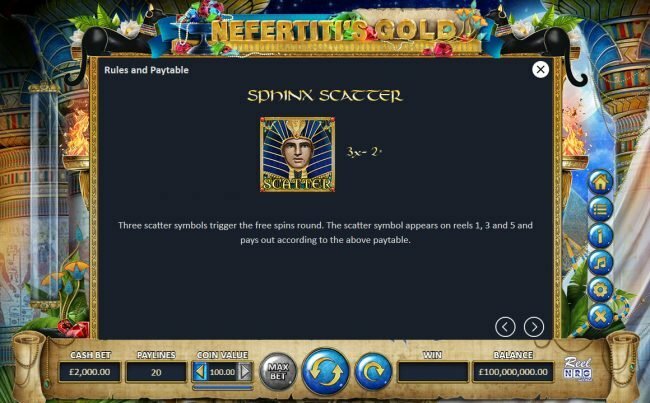 By achieving three Sphinx symbols on reels 1, 3 and 5 this will begin. 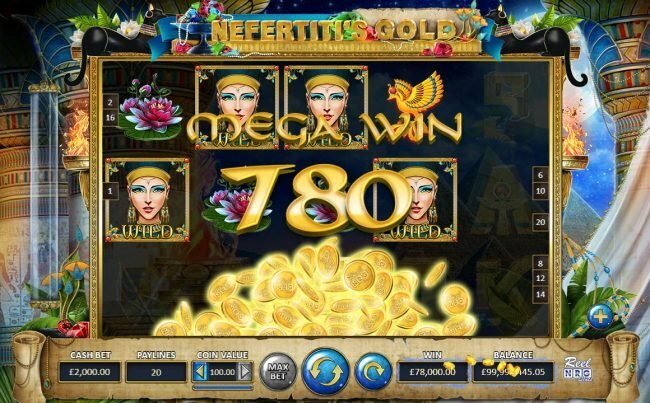 I am pretty sure you know that like most features, the Nefertiti&apos;s Gold feature is where you can really achieve a giant bonus win. Slot features add a lot of enjoyment to modern Slot machines, this is obviously the most exciting feature of Nefertiti&apos;s Gold.